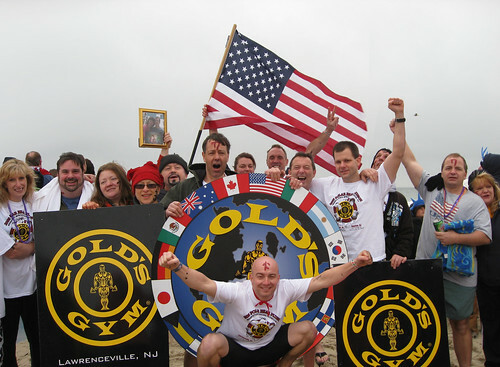 On February 28, 2009 a group of us from Gold’s Gym in Lawrenceville who train in karate together plunged into the Atlantic Ocean. At 1pm, 22 of us and about 4,000 other brave souls ran into the water. Some ran in and sprinted right back out. Others lingered for a bit longer. Personally, I lingered, trying to keep people from leaving the water 🙂 I ran into the ocean four times, each time trying to bring more people back into the water. The first time in, I waded around for a bit, capturing video of the other plungers from the ocean. I used my Canon SD850 IS with its underwater waterproof case (WP-DC15) to capture the video and photos from the ocean. I didn’t stay long to enjoy the three-day party though, since I’ve got lots of work to do. I arrived a few hours before the 1pm plunge time, so I went for a run along the boardwalk and on the beach. I only put in about three miles. While on the beach, I imitated the scene from Rocky where he runs on the beach with Apollo; of course they ran on the beach on a warm day. My socks and shoes got soaked from the cold water as I was right where the water ran up the beach. I returned to the hotel and left my shoes and socks behind so I could return to the beach for a barefoot run. I headed back along the boardwalk and made my way to the ocean. This time I decided to be crazy and run in the water. The water was cold, but it felt great. I ran back to the hotel again, and was able to convince Marci to come for another run with me on the beach, barefoot. If you know Marci, then you would be surprised to hear that she agreed to do this. This time, during my run I hit a pothole in the water and took an early plunge — and this was right in front of some spectators. It was pretty funny. Fun was had by all and we’re anxiously looking forward to next year. You are currently browsing the Sconzo.com weblog archives for March, 2009.